Find out what's new from our range of Toshiba printers and copiers. Call one of our Toshiba experts today. Toshiba printers are well-known for their easy-to-use interfaces. It's why so many offices across Melbourne rely on Toshiba models to get the job done easier and faster. We sell a range of Toshiba printers with cloud printing capabilities, smartphone and iPad integration. It's smart connections like these that make printing documents easier than ever. Service agreements can be customised to suit your photocopier's usage. Regular maintenance checks and toner refills can be arranged to keep your model running smoothly. We offer a large range of new and used Toshiba printers. If there's a particular model we don't have in stock, we can always arrange to get one shipped directly from Toshiba. Our range of new Toshiba printers and copiers can be purchased outright. Finance can be arranged if you would prefer to gradually pay off your new model. New Toshiba models can also be rented for a more flexible alternative. We guarantee our Toshiba models will always be in great working order before purchase. That's because we refurbish and maintain our own range of Toshiba printers. 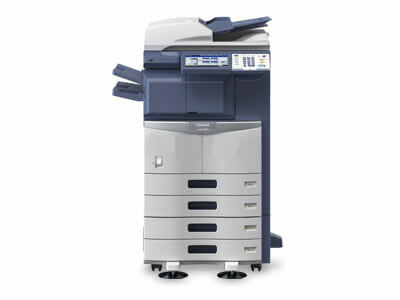 Used Toshiba printers are also available to rent. Since 1992 we've provided offices with Toshiba printers that deliver exceptional print results. We offer Toshiba printers based on each company's unique workflow and budget expectations. In most cases, we can offer same day service calls for photocopier repairs, maintenance, and repairs. Repairs, refills, and maintenance can be covered by a Copysonic service agreement. Our repair technicians all have a minimum of 15 years of experience in the industry. Looking for Toshiba printers that are reliable and easy to use? Ask one of our Toshiba printer specialists. Talk to one of our specialists by phone or email to discuss your office's needs and expectations. A face-to-face meeting can be arranged if required. Our Toshiba specialists will assess your office's needs and provide you with a few quotes for photocopiers within your budget that will satisfy workflow expectations. It's time to choose a payment option for your new photocopier. Finance can be arranged to pay off a new or used model. A lease can be signed if you prefer a short-term plan. One of our friendly technicians will confirm a date to deliver and install your new Toshiba printer. Upon arrival, they will install and integrate the photocopier with your office network. Your new Toshiba printer is ready! Your new photocopier is ready for office use. Your new Toshiba model will be covered by a 12-month warranty that can be extended with a Copysonic service agreement. Can I purchase a new or used Toshiba photocopier from Copysonic? Yes, you can. 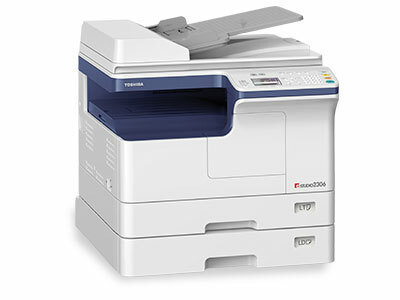 We stock an extensive range of new and used Toshiba printers and copiers. Can you repair and service Toshiba photocopiers? Our experienced technicians are more than qualified to repair and service Toshiba printers and copiers. With a minimum 15 years of experience and access to replacement parts, our technicians have the skills and resources to repair most Toshiba models. What type of warranty can you provide for a Toshiba photocopier? A 12-month warranty is included with every purchase of one of our Toshiba printers. Warranties for Toshiba printers and copiers can be extended with the purchase of a service agreement. Your warranty can be extended up to 5 years and can cover all parts, labour, and toner. Do you sell any Toshiba models with cloud printing and smart device integration? Yes, most of our Toshiba printers are capable of cloud printing and smart device integration. Other great features you'll find in our Toshiba printers include stapling and double-sided scanning. Fill out your details below, and we'll answer your questions about our range of Toshiba photocopiers.